Sferyx proudly sponsors the AuSakai 09 Conference - meet you there ! 1. Can the Sferyx HTML Editor Applet Edition and the Sferyx Equation Editor be integrated into the entire SAKAI system? Yes, both editors are fully integrated - there is a special Sferyx JSyndrome HTMLEditor Applet+EquationEditor bundle and the major part of the Sakai users are this product. We have created it upon request from the Sakai community and it integrates seamlessly with the system - this way out of the box there are both advanced HTML and Equation editing capabilities for the entire system. The Sferyx JSyndrome HTMLEditor Applet+EquationEditor is already integrated with the Melete Lesson Builder out of the box, and this manual explains integration into the entire SAKAI system and all its modules. We have also provided the new Flow toolbar layout especially to be able to accommodate the editor into all small form spaces inside the SAKAI modules. 2. 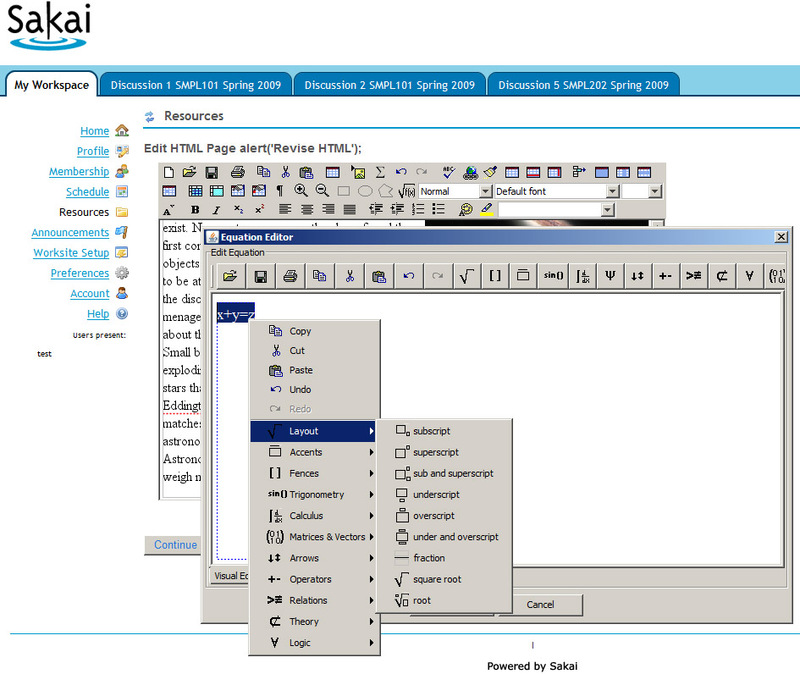 How can I integrate the editor into the SAKAI system? 1) Note: This latest package has been tested against the 2.5.4 Sakai build, but it could be working also with previous releases. 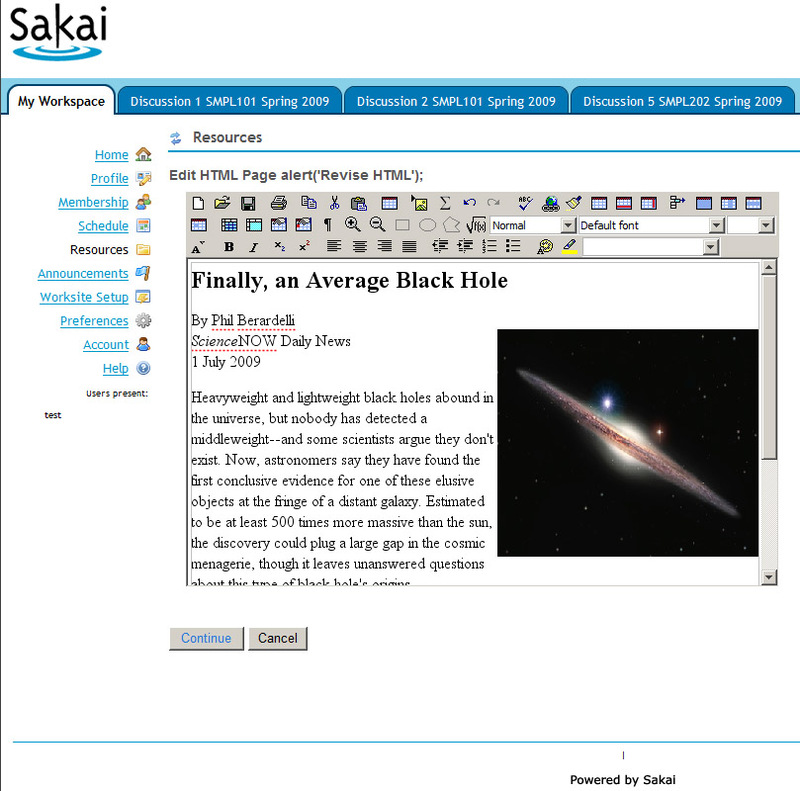 If you want to be sure it will be working out of the box simply install the latest Sakai 2.5.4 demo and use it for testing. the existing "sakai-install/webapps/library/editor/FCKeditor" to "sakai-install/webapps/library/editor/FCKeditor-original" or something similar in order to keep the original files. where "sakai-install" - is the root Sakai installation folder. That's all - there is even no need to restart the Sakai instance - simply make sure to reload the page shown in your browser and the iframes inside as it may be showing a cached copy. 3. How to configure the file uploads for the Sferyx JSyndrome HTML Editor Applet Edition within the SAKAI system? There is only one note to observe - everything will be working as expected including the file uploads from inside the editor- the only limitation currently is that the original Sakai org.sakaiproject.connector.fck.FCKConnector accepts only one file at a time as this is the capability of the FCKEditor itself, while the Sferyx HTMLEditor Applet does not have limitations on the number of the uploaded files and can upload anything, simply currently only one file will be written down by the FCKConnector although all of them are actually received by the server. This can be easily changed by simply modifying the FCKConnector to accept multiple files and it is ready or install and use the Sferyx's SferyxUploadConnector. No need to modify or configure the Sferyx HTMLEditor Applet further. After doing this you are ready and you will need either to reload the /sakai-fck-connector application from the Tomcat manager or to restart the Sakai instance. 4. How to enable the Sferyx JSyndrome HTMLEditor Applet within the Melete Lesson Builder for SAKAI? The Melete Lesson Builder comes already with integration package for Sferyx by default, you can enable it directly from the user preferences menu. There is no need to do anything else, it will work out of the box. 5. What advantages could bring the integration of the Sferyx HTMLEditor Applet, Equation Editor and PDFExport into the SAKAI system? In first place this way out of the box there are delivered both advanced HTML and Equation editing capabilities for the entire system combined with instant PDF generation capability. Furthermore, the Sferyx HTMLEditor is capable of publishing many files simultaneously which is very useful when for example is pasted a Word document which contains many images and other external linked files. This way only by submitting the form everything is sent to the server and the entire document is published within seconds without the need the user uploads all files separately, renaming them and linking them back to the document. All this is done automatically by Sferyx, also it is capable of generating unique image filenames in order to avoid name collisions. This saves a lot of work both for the users and the developers and gets the work done within seconds and if you add to the whole this thing also the PDFExport it can generate on-the-fly PDF files from the documents and publish them together with the HTML to the server. All Sferyx products are assured with continuous e-mail support. With the retail products is included in the price 30 days startup support. Additionally, you can purchase annual support subscription tickets from our web store. Sferyx offers also a wide range of customization services for its products in order to satisfy any customer requirement. We can adapt our products to fit the customer needs and any kind of integration requirements. We execute also express developments, customization under request, development of new features on demand. You can request a quote at sales@sferyx.com or support@sferyx.com indicating your requirements and the terms of delivery.